Grab some cocoa and join me by the fireside, Dear Readers – tis the season to gab about gifting games! Believe it or not, this is the 7th annual Dice Hate Me Holiday Gift Guide, and nothing gets me more in the spirit than sharing some great games with all of you that you can share with everyone else. The list might be a tad late this year, but there’s still plenty of time before Santa loads up that sleigh and flies past Boardwalk and Park Place with all the Rolex and diamonds from Tiffany’s. I hope you enjoy the list, but most of all I hope you enjoy time with family and friends and get everything you wish for. May all your rolls be sixes and your resource cubes plentiful. Happy Holidays and Happy Gaming! It just wouldn’t feel like Christmas without a little nightmare, and the traditional list would be incomplete without an appearance from something Lovecraftian. 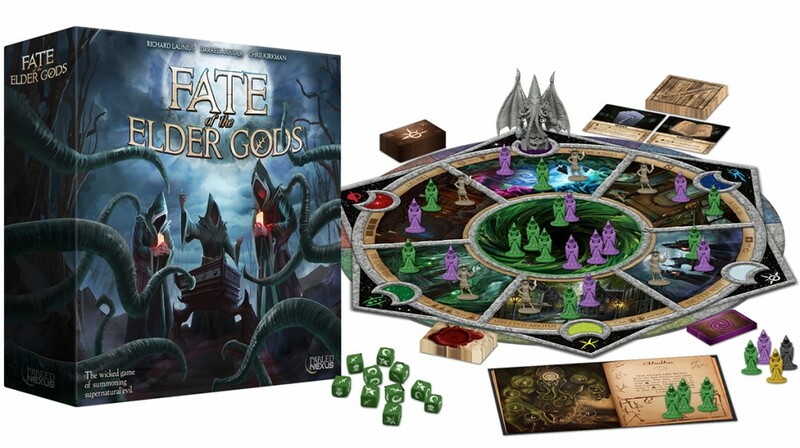 Out of all the Cthulhu-themed games I’ve suggested over the years I can recommend none more highly than Fate of the Elder Gods – because I made it! This love child from myself, Darrell Louder, and the Duke of Dice Richard Launius puts you and up to three other ne’er-do-wells inside the cloaks of cultists, trying to gain the favor of an Ancient One and summon them forth to hasten doom for all mankind. How festive! You’ll do all this by managing spells, sending your cultists to sew dark discord in six locations in and around Arkham, and whispering in the ears of Investigators to pester the other cults with raids and Elder Signs. It’s delightfully mischievous; the perfect gift for that special someone that teeters on the brink of Santa’s Naughty List. Fate of the Elder Gods is a game for 1-4 crafty cultists from Richard Launius, Darrell Louder, and Chris Kirkman. It retails for about $80 and you can buy it online or at your Favorite Local Game Store. I’ve never been the type to hang around the horse track and bet on the ponies, but there’s just such rich spectacle to mine for storytelling when it comes to the races. Plus, horse racing (and camel racing, for that matter) makes for some damn exciting board gaming! Full transparency, this review was originally going to be for Reiner Knizia’s stellar horse racing title Winner’s Circle, but it’s hard as heck to find and that wouldn’t make your shopping list much easier. So allow me to suggest a stellar alternative that can be ordered direct from the publisher and will even fit in your pocket so you can play it at the track! 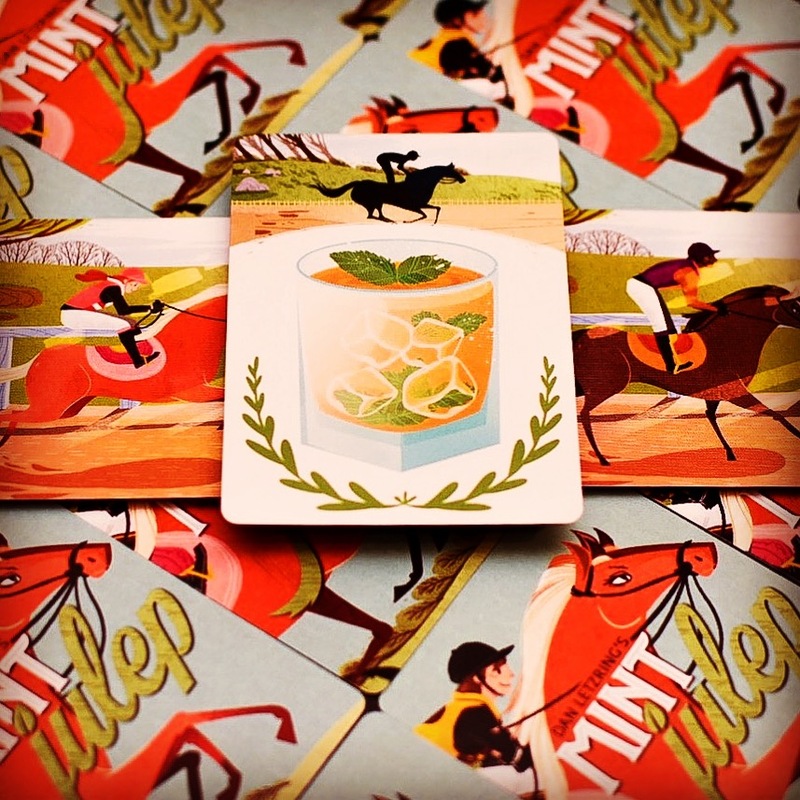 Mint Julep is (like many other ButtonShy games) an 18-card marvel that simulates betting at the races over 3 rounds of drafting cards that can then be used to either bet on a horse or manipulate horses’ positions in the race. It’s fast (just like a real race), addictive (just like a real race), and will score you bonus points with friends and family for bringing them together (unlike hanging around the track at all hours). With its charming play and even more charming art, this gift is a sure bet. Mint Julep is a game for 2-4 horse enthusiasts from Dan Letzring. It retails for about $12, and you can buy it online direct from Buttonshy! Holiday-themed games can be tough; on the one hand you know that they’re going to sell particularly well at one time of the year, but you never know if someone is going to find them interesting the other 11 months. Such was the worry when designer Keith Ferguson came up with the idea for Santa’s Workshop. His perseverance, and the incredible story behind how the game finally came to be, are the stuff of legend. If you don’t believe me, check out episode 140 of The State of Games! At any rate, Santa’s Workshop combines a lot of fairly familiar elements into a wonderful and crowd-pleasing experience. In the game, you’ll control a group of elves doing their utmost to produce the best toys for Santa. It’s fairly standard worker-placement fare, but with some fun twists. First, the toys you make can be done the old-fashioned way with wood and such – which nets you elven cred – but it takes longer. You can substitute plastic to be faster, but it’s not quite as cool. Also, there’s the reindeer. If you take the time to look after Santa’s herd then certain reindeer will grant you awesome advantages. I’ve followed Santa’s Workshop through most of its development, even had the privilege to play a few times, and I can’t wait until I can share this special holiday treat with those I love. It’s important to note that Rio Grande Games has really cut it close on the release date with this one – December 18th – but if you put in a preorder now you might just be helping out Santa on Christmas Eve, and everyone could use some extra points on the Naughty/Nice list. Santa’s Workshop is a game for 2-5 dutiful elves from Keith Ferguson. It retails for about $45 and you can preorder it online or ask for it at your Favorite Local Game Store. I like to think that I keep my finger on the pulse of the boardgame community pretty consistently, but occasionally I’m ambushed by a game or two. Such was the case with Sentient at Origins. I had no idea it existed but when I saw the pretty pink box with designer J. Alex Kevern’s name on it in the Renegade Games booth at Origins Game Fair I simply couldn’t resist. For the dice loathers out there, you’ll be pleased to know that you only roll your dice three times during the game; once each round to set up the five manufacture slots for new robots that will score – if you’re lucky or wily. Each round you’ll be placing an agent (along with optional assistants) into factory slots which will allow you to place the robot there into your corporation. Your corporation is where the dice are located and where the difficulty lies. You might draft an industry robot that needs an even number on the left and an odd number on the right. That robot might also have a “-” symbol in the upper left and a “+” symbol in the upper right, meaning that it will change the dice on either side of the placement up or down a level. You might select a slot that has a 3 die on the left and a 5 die on the right; the minus in the upper left corner will move the left die down to a 2 fulfilling the Industry robot’s left-side requirements. The right side is a bit more problematic; there’s a 5 there but the “+” symbol will spin that up to a six – an even number. You can use an available assistant to block that die change, thereby preserving the 5 and eventually scoring the Industry robot at the end of the round (provided you don’t mess with the die on either side until then). It’s all a bit of a puzzle to explain – and there’s even more going on with the area control bits up in the factory – but the truly satisfying puzzle is in playing this challenging and fun game. 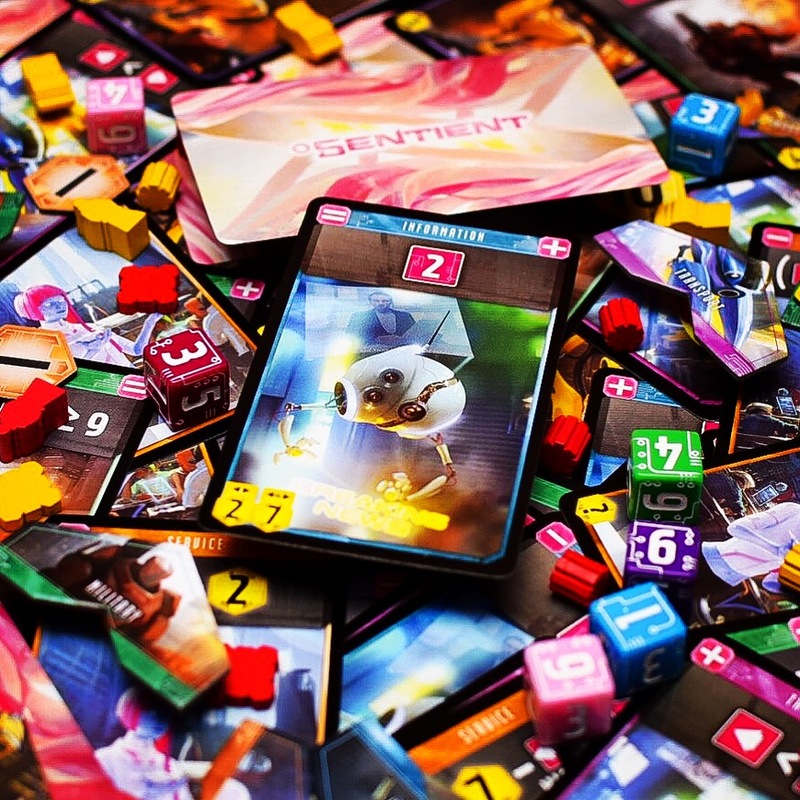 Sentient is a game for 2-4 robotics engineers from J. Alex Kevern. It retails for about $55 and you can buy it online here or at your Favorite Local Game Store. When Flamme Rouge was released late last year practically everyone thought it was either the bees knees, the cat’s pajamas, or just plain bananas – and bananas is good. I adore racing games, but to me, since bicycle racing is about as exciting as tennis, I just wasn’t having it. Then I played it… and after a crushing defeat I still wasn’t having it. And then a funny thing happened: I kept thinking about the game, and what I could have done differently. In a world where a different game is released on what seems like an hourly basis, it’s sometimes rare to be able to return to a game that you felt was subpar. But return I did, and as I played games two and three I started to get better – almost like a real cyclist might when they train. I learned to watch my opponents carefully, judging how I could best draft and save energy. I learned not to sprint out ahead with my fast cards early because that just means I’ll be putt-putting along in the far rear when that last bit of road appears. But overall I learned how a good game can sometimes surmount an endless variety of personal prejudices in theme and initial experience to become a fun exercise in pedals and patience. And if it can do that for me, imagine what it can do if you or someone you love actually likes cycling. Flamme Rouge is a game for 2-4 Tour de France enthusiasts from Asger Harding Granerud. It retails for about $60, and you can buy it online or get it from your Favorite Local Game Store. Let me just clarify one thing before we continue: There’s nothing wrong with Spades. Or Hearts. Or many traditional trick-taking games. But ever so often you just wish the family could try something just a little bit different. Well, if you want different, AEG is here to deliver. At its core, Custom Heroes is a simple climbing game; if a player leads with four threes then the next player must play at least four cards of value four. This continues around the table until no one can play cards and then the last person to play cards becomes the lead player. Depending on when you run out of cards depends on what rewards you get for that round, including card advancements which really make the game special. These advancements are clear plastic and can slide into and modify any card in your hand at any time; this is part of the Card Crafting System first introduced in Mystic Vale. Some advancements can give you sidekicks that allow you to activate them with tokens, while others add or subtract from the total of the card’s original value and has your character holding something odd like a hot dog or cabbage, or something cool like a plasma gun. So I can picture what you’re thinking now – what if my Aunt Sally isn’t into hot dog-wielding catgirls or cat-wielding robots? You’ll never know until she unwraps this charming oddball and throws it on the table, will you? 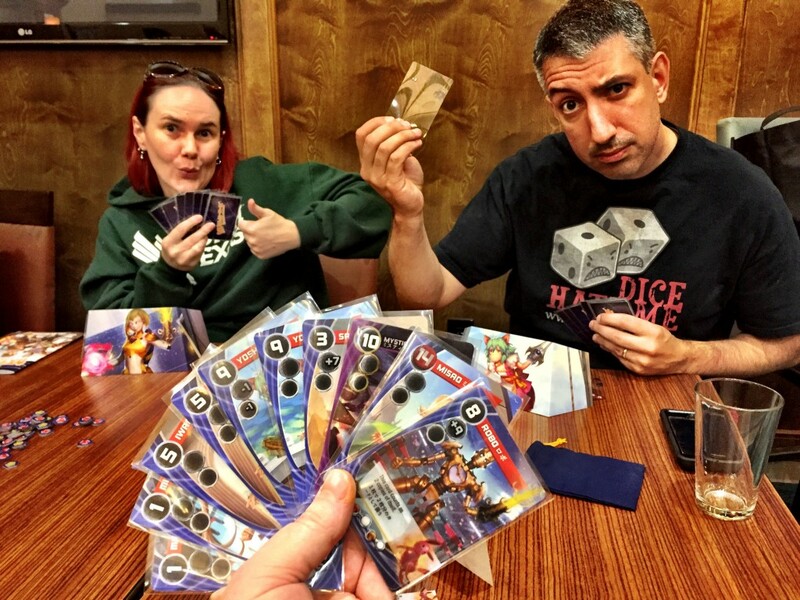 Custom Heroes is a game for 2-6 tricky takers from John D. Clair. It retails for about $30 and you can buy it online here and at your Favorite Local Game Store. At the beginning of the 16th century, Ulm had one of the largest municipal territories within the Holy Roman Empire of the German Nation. Success and wealth are not only due to Swabian thriftiness, but mainly the results of the citizens’ business acumen and skilled…. That’s an excerpt from the rulebook. It goes on to talk more about historical Germanic facts, like a river, a cathedral that needs to be built, salt, wood, proper citizenry, etc. You know, European things. 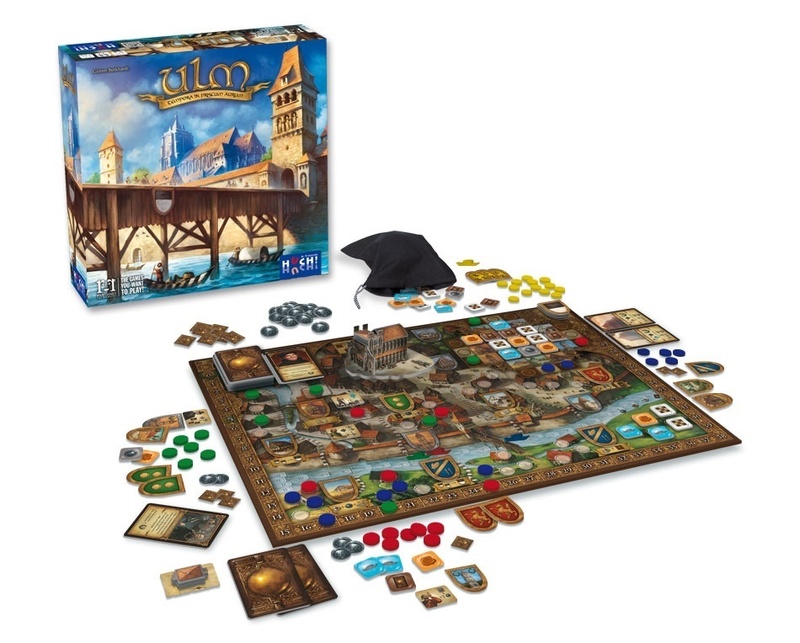 The game of Ulm is a tad more exciting than the lead-in for its theme. There’s a river, the Danube, and you’re going to travel down it. You’re also going to be placing seals from your house on various locations along the river bank. As you reach sections of the Danube, you’ll get to take actions if you have a seal along that spot. You’ll use these actions to take cards, gain points, and generally do very Euro-y things. What sets Ulm apart, though, is the Cathedral grid. Each turn you’ll draw a tile from a bag and use it to push three tiles along a 3×3 grid. The tile that is pushed out of the grid is gone and not used; you’ll take the various actions provided by the row or column of 3 tiles you just created. This simple mechanism not only makes you feel smart by setting up cool combos, it also creates a huge amount of tension when it’s not your turn. Will Timmy clear away that money action I really need before it’s my turn? Probably. But you’ll still love the game, anyway. Oh, and hey – you get to build the main tower of a 3d cathedral during the game which acts as a game clock, so that’s pretty awesome. Besides, you’ll need that cathedral in order to confess about all the swearing you’re going to do when Timmy takes away your money action. Ulm is a game for 2 to 4 whatever-the-agency-is-you’re-representing-in-this-game from Günter Burkhardt. It retails for about $40 and you can buy it online or at your Favorite Local Game Store. First off, if you a) haven’t heard about First Class, or b) don’t already have First Class, then you haven’t really been paying attention to Dice Hate Me or The State of Games over the past 9 months. And that’s totally ok, except that you’re missing out on one of the best games of the year. 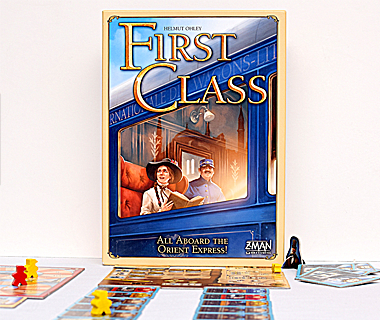 First Class is a great next step for gamers that are used to Ticket to Ride not only because of the train theme, but also because it can truly show next-level gaming with the same sort of straightforward and fast gameplay. Just like in TtR, you’ll be drafting cards and using them to set up train routes and extending the length of your trains. Unlike in TtR, however, you’ll be setting up incredible combos that will make you feel ever-so-smart. And since this all takes place on the Orient Express, there’s even a “murder module” that you can plug in to channel your inner Hercule Poirot. Mustache not included! First Class is a game for 1-4 railroad tycoons from Helmut Ohley. It retails for about $50 and you can buy it online or at your Favorite Local Game Store. You can also get a much more comprehensive review of the game right here on Dice Hate Me! I’ll easily admit, I’m not the biggest Knizia fan. But if he’s throwing bidding or auctions into the mix, I’m showing up, front and center. The original Medici board game is one of my favorite bidding games of all time; I wore the crap out of that app on my iPad. There have been a lot of “X the dice game” or X the card games” lately, but none have been quite as successful at capturing the essence of the original game while making it easier to teach and play than Medici: The Card Game. Give it to your significant other, give it to your grandma, give it to your fifth grade class – just for goodness sake give it! 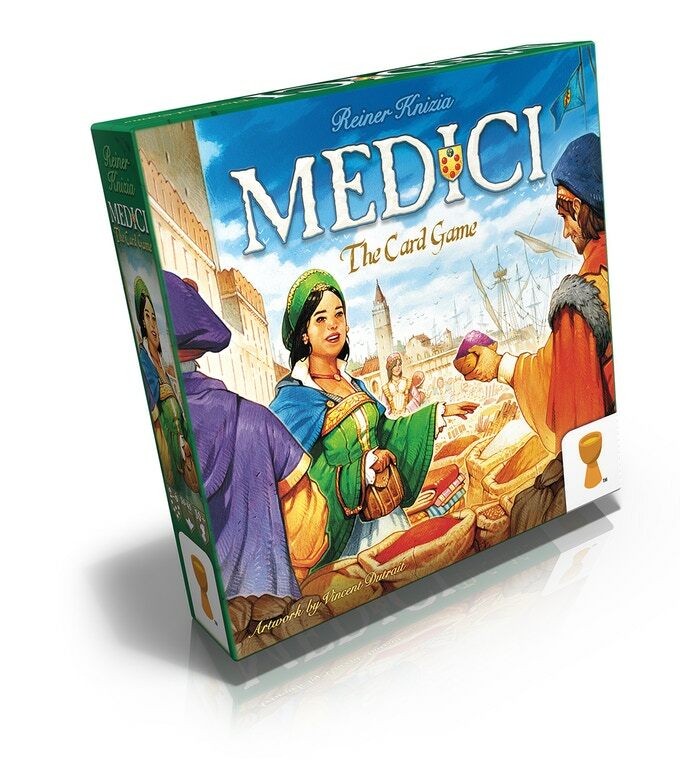 Medici: The Card Game is a game for 2-6 spice and fur traders from Reiner Knizia. It retails for about $22 and you can buy it online or at your Favorite Local Game Store. As it says right on the package, it’s “the definitive travel game”. And that’s no hyperbole. I never leave home without this precious gem. Designed by wonder twins Ben Pinchback & Matt Riddle you’ll draw three cards before each road trip – an easy thing, a medium thing, and a hard thing – and scour the countryside to be the first to spot all three. C’mon, you know you need this – not only is it only 12 bucks, it also has Santa Claus in the title! 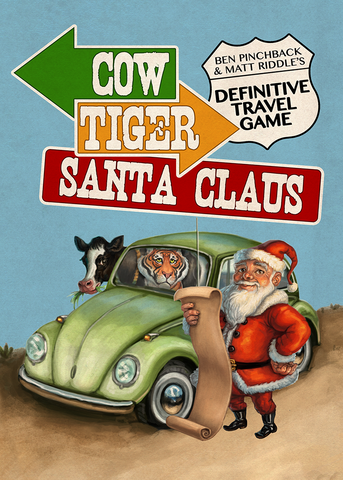 Cow, Tiger, Santa Claus is a game for a whole carload of awesome people from Ben Pinchback & Matt Riddle. It retails for about $12 and you can get it direct from the Buttonshy right here! One of the best two-player games of all time is now available on iOS and it has an excellent AI which will challenge you at various settings. You might think this means you no longer need your partner, but the game also includes an incredibly well-executed pass-and-play mode! Not only is this an excellent app, it also has the Yspahan seal of quality – it’s designed by Sebastien Pauchon and it features camels! How could you possibly go wrong? 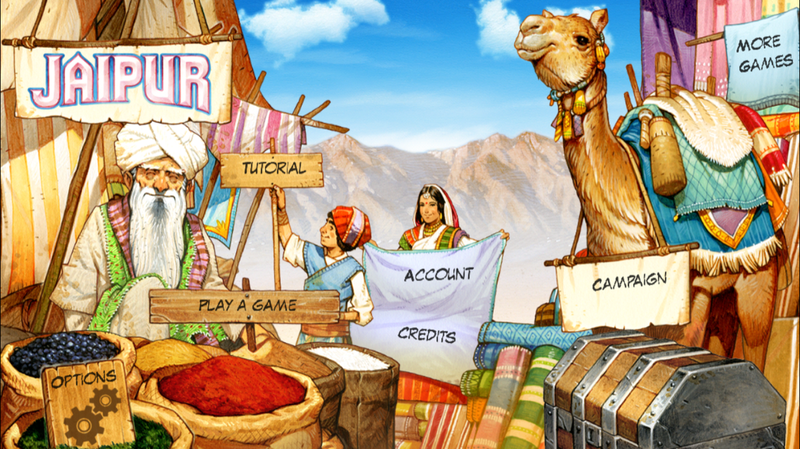 Jaipur is from Asmodee Digital. It retails for $4.99 and you can buy it online here for iOS and online here for Android. First off, it ain’t cheap at $99. Second, it ain’t exactly easy. 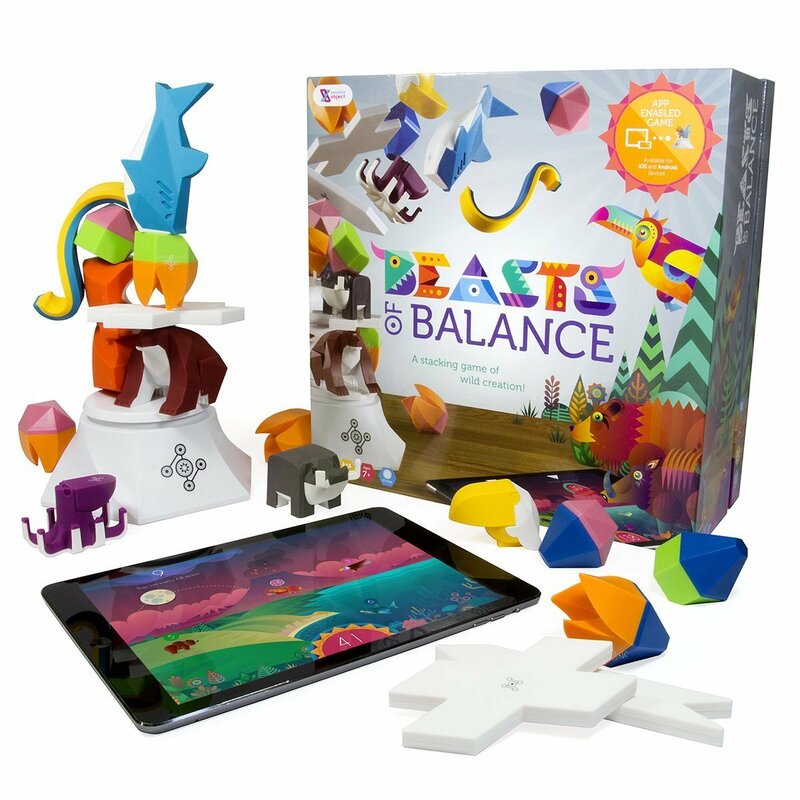 But despite those first two things, Beasts of Balance is an incredibly awesome dexterity game that the whole family will enjoy. The game is app-enabled, which means you’ll need a smart device to play. But that smart device will encourage you to not only balance things in the real world, but also look after and score creatures in the digital world, including creating new hybrid creatures that cavort about the landscape! I guarantee an engaging experience for yourself and anyone else you share this wonderful game with. Beasts of Balance is a game for 1-5 dexterous delvers from George Buchenham and Alex Fleetwood. It retails for about $99 and you can buy it online here. Don’t forget to check out previous Holiday Gift Guides below – there are six more years of great gift ideas! Thanks for the shoutout Chris! Santa’s Workshop is currently being shipped, and may start appearing in stores as early as this weekend – Dec 9-10. Currently working on the expansion, which will include electrocutions and rivers of blood. Wait, what?